Castleknock take the N3 to the Auburn Avenue Roundabout, turn left and straight up Auburn Ave to Castleknock, or take the No 37 or 38, a bus from the City Centre, this stops outside the Church and graveyard. This parish dates back to 1185 when Richard de Tyrell, son of the first Baron of Castleknock, gave a grant to the Benedictine Monks of the Abbey of Little Malvern, Worcestershire, to endow a religious house at Castleknock in honour of Saint Brigid. The foundation stone of the present Church at Castleknock was laid on Oct 20th 1803. Both church and cemetery are still in use. 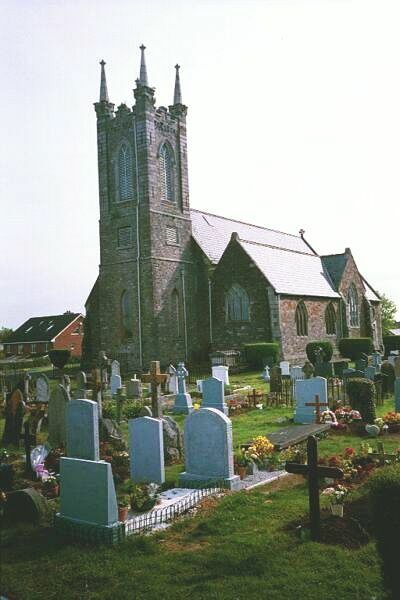 While the church began as the Church of Ireland, the cemetery is now used for all faiths. I went to this cemetery and surveyed it, using my digital camera, on 19 May and the 26 May 2005. This is a complete transcription of all existing and legible headstones up to those dates. Green, Sir John, d. 29 May 1976, h/o Lady? Kerrigan, Denis, d. 21 Jul 1965, h/o Mary (Molly), Carnew Street. Anna Ryan and Peter Duffy contributed partial transcriptions of the same headstones, which we combined into one. Access that transcription here.